For the longest time I was on a search for the perfect ramekin so I could make recipes like creme brulee and french onion soup. 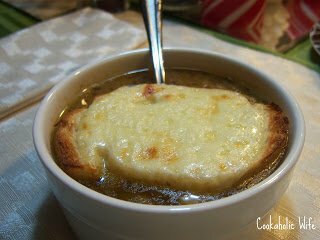 It never occurred to me until I was reading Joelen’s recipe for french onion soup that I could just as easily broil the bread in the oven and add it to the soup. Of course, the next day I finally found the perfect set of ramekins. Actually, they aren’t anything special. They’re standard white ramekins from Walmart, but it took me forever to find a set of 4 that matched and were the same size. You’d think this would be an easy task, but it really wasn’t. I made a few adjustments to the recipe, like I substituted sliced Provolone cheese for Gruyere since the middle of no where doesn’t carry Gruyere cheese. 1. In a large pan melt the butter over medium heat. Add in the onions, garlic, bay leaves, thyme and salt and pepper. Cook the onions until caramelized and soft, about 25 minutes. 2. Add in the wine and bring to a boil. Reduce the heat and simmer until the wine has almost completely evaporated. Remove the bay leaves and thyme. 3. Add the flour to the pan and stir well until all of the onions are coated. Reduce heat to low and cook for about 5 minutes. 4. Add the beef broth and bring the soup back up to a simmer. Add salt and pepper to taste and cook for 5-10 minutes more. 5. For the bread, preheat the broiler and arrange slices of bread on a foil lined baking sheet. Top bread with slices of cheese and broil for 1-2 minutes until bread is toasted and cheese is melted. 6. Ladle the soup into bowls and top with the melted cheese bread. The verdict? OMG. Drool. Never in my life have I wanted to be a cheesy piece of bread floating around in a bowl of soup until that moment. The soup was perfectly seasoned, it had just the right amount of onions, the bread got all soggy delicious in the soup, there was this amazing rich flavorfulness and the cheese had the perfect amount of stringy gooeyness. I couldn’t decide whether I wanted to eat the soup slow to enjoy all of the flavors or if I wanted to gulp it down because it was so tasty. In the end, I opted to be an adult and eat the soup properly. But that doesn’t mean you have to. Tom mentioned that the soup would make a wonderful au jus. So, the leftovers are currently hanging out in my freezer until I can make au jus sandwiches. Sandwiches au jus? …whatever. You know what I’m trying to say.